On Tuesday night, President Trump gave the first primetime Oval Office address of his presidency to make a case for border wall funding. The address aired on all major broadcast and cable news networks, and it was immediately followed by a response from House Speaker Nancy Pelosi (D-Calif.) and Senate Minority Leader Chuck Schumer (D-N.Y.), in which Schumer referred to the President as governing “by temper tantrum.” Naturally, late-night hosts had a field day with all this. 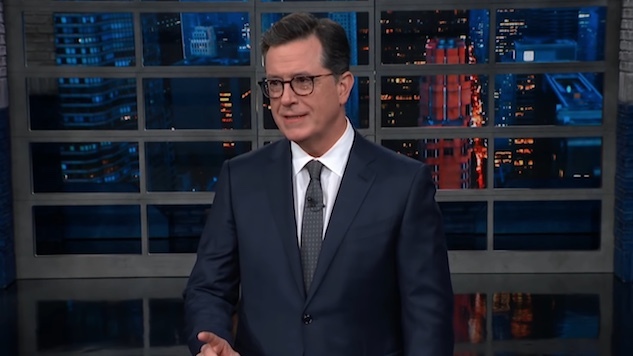 On CBS’ The Late Show, host Stephen Colbert referenced the address interrupting his own network broadcast of FBI, a police procedural show. “Not the first time he’s interfered with an FBI investigation,” Colbert quipped. Late Night host Seth Meyers recalled his old job as SNL head writer with a tweet during the address reading, “Somebody please add ‘and live from New York, it’s Saturday Night!’ into the teleprompter.” Meyers also took to Twitter to ask, “Is this Oval Office: SVU?” before his show’s broadcast later in the night. The joke has been met with backlash from Megyn Kelly, Donald Trump Jr. and other conservative Twitter pundits. “And we have a President who is completely ill-equipped to handle this crisis because he has neither,” Corden said.